* The exhaust vent on the Exhalation Port is designed to exhaust CO2 from the patient circuit. Continuous flow is required for safe operation do not block or otherwise try to seal the exhaust vent on the exhalation port. * Before instituting mechanical ventilation, confirm the proper connection of the circuit and verify ventilator operation. Patient, ventilator, and circuit must be monitored on a regular basis per established standards of care. * Do not pull or stretch the circuit tubing. This could result in circuit leakage. 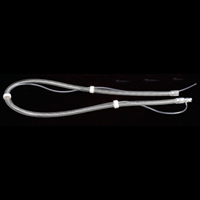 Note: A low- resistance main flow bacteria filter must be placed between the outlet and the circuit tubing. (1)	Connect a low: resistance, mainflow bacterial filter on the outlet port of the machine. Connect the cuffed end of smooth inner lumen tubing to the outlet port of the filter. (2)	Connect the other end of the tubing to the patient interface. The vent on the exhalation port should be positioned away from the patient’s face. (3)	Connecthe proximal pressure line to the port marked "PRESSURE" on the front of the machine unit. This circuit is designed for single patient use. It is not intended to be cleaned or sterilized. The length of time a circuit is used should be determined by the institution’s accepted infection control procedures.